Catch it while you can, because you won’t be seeing it again for a while. 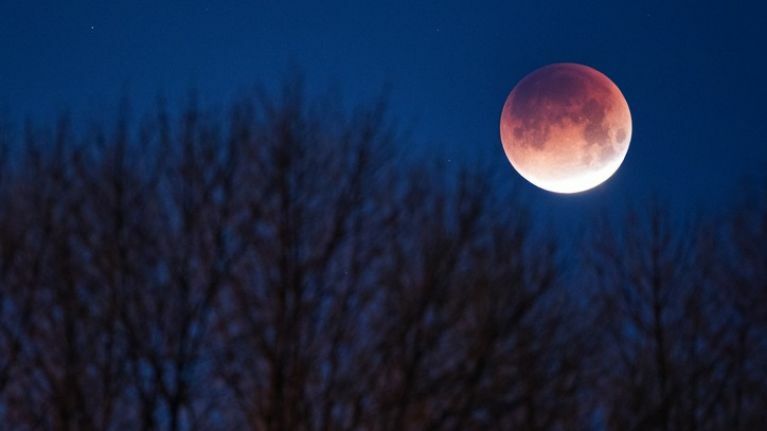 Stargazers across Ireland are in for a treat this weekend, when a total lunar eclipse will provide a stunning sight in the skies in the early hours of Monday morning. This weekend’s eclipse, known as a Super Wolf Blood Moon because it falls in January – you can thank the Native American calendar for the deadly name – is expected to be the last total lunar eclipse visible in this part of the world for over a decade. For the uninitiated, a total lunar eclipse occurs when the Moon and Sun are on opposite sides of Earth. During some stages of a lunar eclipse, according to NASA, the Moon can appear reddish (hence the term ‘blood moon’) because the only remaining sunlight reaching the Moon at that point is from around the edges of the Earth, as seen from the Moon's surface. From there, an observer during an eclipse would see all Earth's sunrises and sunsets at once. According to timeanddate.com, the total eclipse will begin for stargazers in Dublin at approximately 4.41am on Monday morning (21 January) and will end by approximately 5.43am. A partial eclipse, meanwhile, will begin at approximately 3.33am and end at 6.50am, extending the window slightly; you can check the relevant times for the nearest location to you in Ireland here. No matter where you are, it will require an early start and a need to avoid pressing the snooze button on Monday morning, but it will be well worth it.